The holidays are here (yay!) and that means extra time with family, wrapping and unwrapping presents, and LOTS of baking. In between the dozens of snowflake sugar cookies, you may need some extra energy in order to get through the holiday baking whirlwind, and that’s where these Gingerbread Spice Protein Bites come into play! 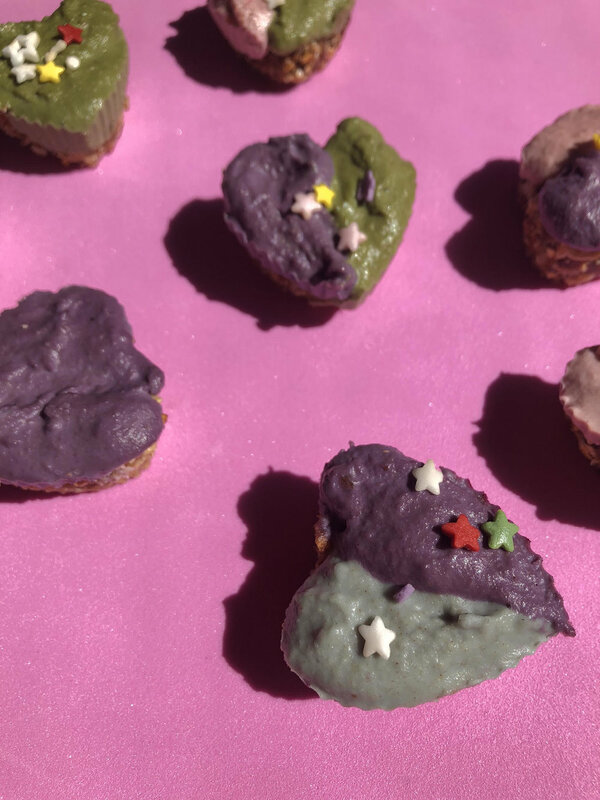 They are no bake so you can give your oven a break and they are made almost entirely of nuts, seeds, and spices, so you can add a little nutrition into your or your mini chef’s day. 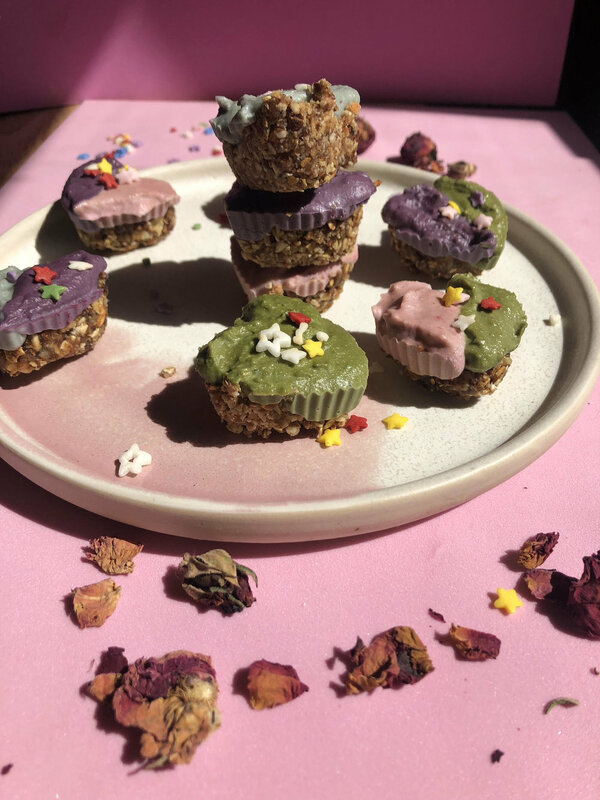 And just because these bites are healthy, does not mean they can’t be pretty enough to sit out like the rest of cookies on the kitchen counter. Use a cookie cutter to shape them into gingerbread men and drizzle on coconut butter for a wintery effect. Once finished, pop them in the freezer for yummy snacks until the New Year. Happy Holidays! 1 cup of pitted medjool dates, soaked in warm water for 20 mins ( you can reserve to the water to use a sweetener for baked good). Process dates in a food processor until the dates resemble a ball. Add the pecans and almonds and process until mixture comes together (about 1-2 mins), leaving some of the pecans chunky. Stop the food processor to scrape the sides. It should be very sticky. Add the the remainder of ingredients and pulse until combined. Transfer dough to a 9x12 baking dish, using your hands press the dough down firmly. I like to make my bars about 1 inch thick. Place in the freezer to first about for about 15 minutes. Cut into 10 bars or use a gingerbread person cookie cutter to cut out shapes. Drizzle melted coconut butter over the bars or gingerbread people. I like to keep the bars in the freeze wrapped in parchment paper, but they can also be left at room temp. 1. Add 1 cup quinoa to a large pot with 2 cups water. Bring to a boil. Reduce to a simmer and cook for 10-15 minutes until all water is absorbed into quinoa. Set aside. 2. Chop 2 cups of broccoli florets into bite sized pieces. Place into a large bowl. Add a small amount of water to the bottom of the bowl. Place in microwave with a large plate covering the top of the bowl. Microwave for 1-2 minutes to soften/steam broccoli. Drain water and set aside. 3. Add 1 tbsp sesame oil or use cooking oil spray to coat a large pan. Let oil warm up for 30 seconds. Place softened broccoli and 2 cups of slaw in a large pan. Add in chili powder and garlic powder. Let veggies cook for around 5 minutes, until raw slaw is softened. 4. Add shredded chicken (see recipe below for my favorite way to cook) to pan. Add soy sauce. Let everything cook for several minutes longer then take off stove and transfer to a large bowl. 5. Take 1 cup of the cooked quinoa and combine in large bowl with veggie/chicken mixture. Add more soy sauce for flavor if desired. 6. Top with crushed cashews (or nut of choice) for some crunch, drizzle sriracha for spice, or slice fresh avocado for creamy coolness. 7. Can be served, hot, warm, or cold. Refrigerate for a 1-2 weeks. Take 1-2 lbs. chicken breast and add to a crock pot with a small amount of water. Cook the chicken on high for 4-6 hours. Remove from crock pot and use a fork to shred chicken. October is here and with that comes chillier weather and pumpkin flavored everything! You and your mini chefs may not be pumpkin-obsessed (don’t worry, we aren’t either), but you will definitely fall in love with these Spiced Pumpkin Pie Tahini Bliss Balls. They are so simple to make and are allergy free, so go ahead and pack them in your kiddos lunch all October long. Mid-August heat means that it's way too hot to turn on the oven and make traditional pizza, so give this fun fruit version a try! Watermelon pizza is a great way to make sure your kiddos stay cool and hydrated as watermelon is packed with water and good nutrients. They will also have the best time getting super creative with their pizzas. 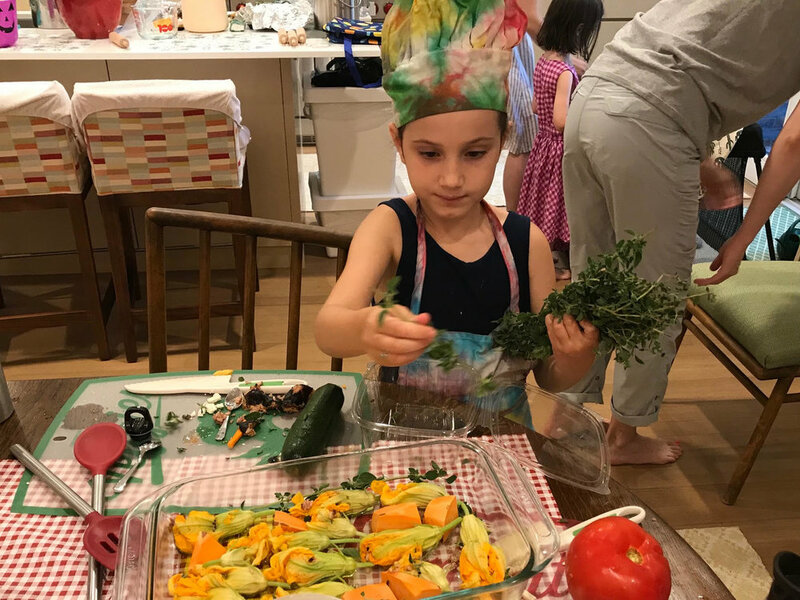 At Tiny Turnips Kitchen, our mini chefs used cookie cutters on the watermelon rounds to punch out shapes like stars and hearts and add to the pizza as toppers. Don't forget to sprinkle on some sweet garnishes like chocolate chips and coconut flakes. This perfect summer dessert is easy, healthy, and most importantly fun!